Feel that chill in the air? Fall has officially begun, and nature has certainly taken note. Soon the leaves will start changing, taking on hues of red, gold, and orange, and the whole look of your home will take on that cozy autumn feel. Many homeowners opt to incorporate nature into their decorations for the fall, such as by using pumpkins, gourds, and pinecones to create centerpieces, hanging wreaths with fall leaves, and piling haystacks and ears of corn by the mailbox to really celebrate the harvest season. But how can you go even further to coordinate your home with the fall backdrop? Read on to find out Carroll Awning’s number one tip. 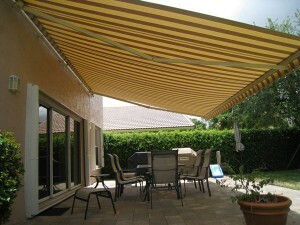 Our selection of residential awnings comes in a wide range of colors and designs. Since now is the season that nature shows off some of its most impressive colors, why not take that into consideration when choosing your new awning? An awning in a shade of goldenrod yellow, deep gold, or rusty red will match your yard’s trees perfectly! You could even opt to combine your favorite fall shades with a striped awning that will be as eye-catching as it is practical. And awnings are a practical home addition, particularly in the fall. Fallen leaves will be kept off of your porch and deck, and you’ll gain the perfect shaded outdoor spot to sit with your afternoon cup of coffee, or a late night apple cider! The best part about your autumn-themed awning? The colors are so classic that even when the weather has taken a turn again for the warm and sunny, your awning will still be a perfect match! Thinking about having a new awning installed this fall? Call on Carroll Awning Company today for more information!